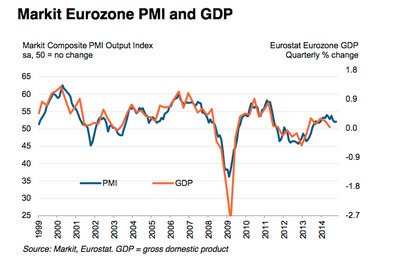 Markit’s eurozone PMI Composite Output Index — which is based on a survey of thousands of companies — inched higher to 52.1 in October, up from 52.0 in September. Although this signals the 16th consecutive month that output grew (any number above 50 indicates growth), it wasn’t all positive news. “Spain and Germany all reported increases in new business, but this was partly offset by contractions in Italy (fastest in 11 months) and France (steepest in 16 months),” the Markit report said. 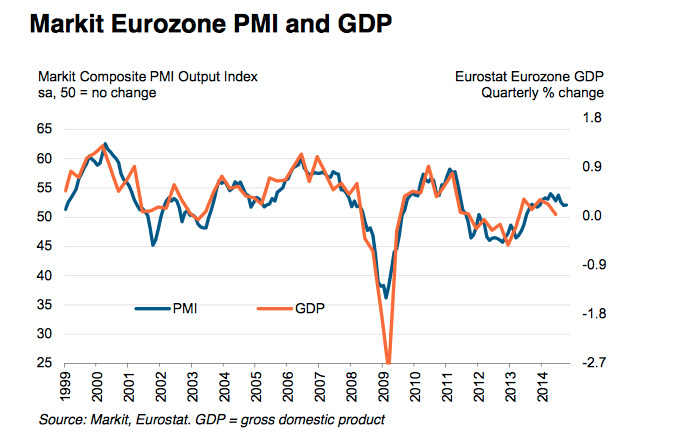 The eurozone’s services industry fell to 52.3 in October, down from 52.4 in September.